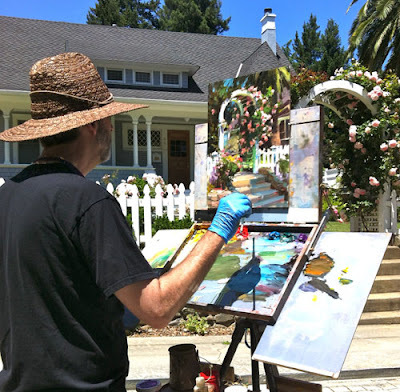 This is me participating in the 2012 Los Gatos Plein Air paint out last week. I was out scouting around with Brenda Boylan when we found this rose arbor two streets up from my host. We both decided it would make a fine subject and came back the next morning. I slipped the blue gloves on and started painting around 9:30 am. Then I put the brush down around noon when Brenda said she was hungry. My painting won Second Place during the event. First Place went to Lori Putnam for a beautiful painting of some out buildings in a grove of eucalyptus trees. (I don't know where Lori found her location, but her painting was so good I did not mind running a second.) The Los Gatos Rotary Club runs a fine event and I highly recommend other plein air painters consider submitting some work next year. Not only do they run a great show, they have a blast while they do it! And people are buying art there. Unfortunately, I suffered the dreaded 'Ribbon Curse' during the Friday Evening Gala Night. (Ha!) Something Ned Mueller personally introduced me to several years ago when he pinned me an award during the 2008 Pacific Northwest Plein Air event and then immediately apologized for doing so. (Ha again, Ned! Funny. I almost snorted wine out of my nose when he said that.) But I've learned that the ribbon curse can come true. Ned's a real pro, and an experienced participant at these kinds of events. He knows. It has happened to him and it sometimes happens to me now. But I can live with it because eventually these paintings sell. Usually for more $$ since there is no silent auction involved. So folks, I brought this sweet baby home in fine condition. With very little mileage. Come on down and take a peak. It's available to a nice collector of flower paintings. At least until July 25th when I toss it into an upcoming Solo Show to be held in Portland, Oregon.